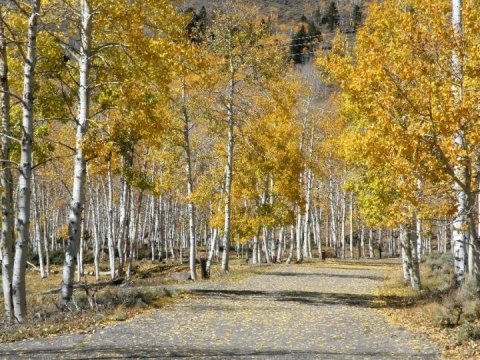 Researchers have conducted the first complete assessment of the Pando aspen clone and the results show continuing deterioration of this 'forest of one tree.' While a portion of the famed grove is recovery nicely as a result of previous restoration, the majority of Pando (Latin for 'I Spread') is diminishing by attrition. Utah State University researchers Paul Rogers and Darren McAvoy have conducted the first complete assessment of the Pando aspen clone and the results show continuing deterioration of this 'forest of one tree.' While a portion of the famed grove is recovery nicely as a result of previous restoration, the majority of Pando (Latin for "I Spread") is diminishing by attrition. Rogers and McAvoy, in a PLOS ONE publication released 17 October, 2018, show Pando, Utah's massive, yet imperiled, aspen clone, is in grave need of forest triage. Early protection from fencing showed great promise in abating browser impacts, which have nearly eliminated recruitment of young aspen stems for decades now. However, follow-up fencing of a larger area (in combination with about half of Pando remaining unprotected by fencing) is currently failing according to this study. "After significant investment in protecting the iconic Pando clone, we were disappointed in this result. In particular, mule deer appear to be finding ways to enter through weak points in the fence or by jumping over the eight-foot barrier," says Rogers, Director of the Western Aspen Alliance and Adjunct Faculty member in USU's Wildland Resources Department. He further adds, "While Pando has likely existed for thousands of years -- we have no method of firmly fixing its' age -- it is now collapsing on our watch. One clear lesson emerges here: we cannot independently manage wildlife and forests." In addition to presenting the first comprehensive analysis of forest conditions, the study offers a unique 72-year historical aerial photo sequence the visually chronicles the a steady thinning of the forest, past clear-cuts that remain deforested today, and continual intrusion of human development. Taken as a whole, objective analysis and the subjective photo chronology reveal a modern tragedy: the "trembling giant" that has lasted millennia may not survive a half-century of human meddling. Pando is widely considered the world's largest single organism weighing in at an estimated 13 million lbs. (5.9 million kg). Covering some 106 acres (43 ha) in south-central Utah's Fishlake National Forest, the clonal colony consists of more than 47,000 genetically identical above-ground stems or "ramets" originating from a single underground parent clone. Quaking aspen, Pando's iconic species, was named Utah's State Tree in 2014 and, among numerous values, is considered a staple of scenic montane landscapes in the American West. Rogers sees trends found at Pando occurring across the western states, thus the Western Aspen Alliance serves as a clearinghouse of contemporary aspen sciences for professionals, scientists, and policymakers. Rogers concludes, "In addition to ecological values, Pando serves as a symbol of nature-human connectedness and a harbinger of broader species losses. Here, regionally, and indeed internationally, aspen forests support great biodiversity. This work further argues for 'mega-conservation' as a departure from traditional individual species-habitat approaches. It would be shame to witness the significant reduction of this iconic forest when reversing this decline is realizable, should we demonstrate the will to do so."